Day 1.To Kibale National park /Fort portal. 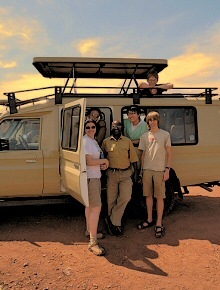 You will be picked from your hotel in the morning by a tour guide from AA safaris and tours, to start your Uganda Safari. He will brief you about the trip and then drive to transfer to Kibale national park passing via Hoima to Fort portal. Kibale national park has the greatest population of chimpanzees which are man’s closest cousin. You will lunch en route but your dinner will be at either. Budget; Chimps nest bandas/ Rwenzori view guest house. You will have breakfast very early and go Chimpanzee trekking. The major tourists’ activity in Kibale is chimpanzee trekking which starts from Kanyankyu at 8 am and 02 pm every day. During the trekking, expect to see other types of primates like the most grey-cheeked mangabey and red-tailed monkey. There will be plenty of bird and you will hear them siging the forest although it may be very hard to spot them. After your lunch, you will go for nature walk in Bigodi Swamp. After breakfast in the morning, you will drive to Queen Elizabeth national park and this should not take you so long to get there therefore you will have lunch there, relax a little as you wait for the evening game drive to have an opportunity to see various wildlife like the lions, antelopes, Zebras, various bird and trees species before you can retire from the days’ activities. Your dinner and over night will be at any of the lodges below. You will just take a cup of tea or coffee and then go for a game drive along Kasenyi track to see the herds of Buffalo, Elephant, Warthog and Lion. At mid morning, you will go back to the lodge for breakfast, relax at the lodge. After lunch, a two-hour launch cruise along the Kazinga channel to offer the visitors a chance to encounter a large population of hippo and various bird species common to the park and they are over 550 species in that park. Your dinner and overnight will be at your lodge. Day 5: chimpanzee tracking/ Transfer to Bwindi. You will wake early enough, have your breakfast and then go for briefing before to start trekking Chimpanzees which are the closest to man in nature but you will also encounter other primates like the monkeys. The trekking may take some long hours and therefore you will have to carry your packed lunch as you may not be able to return to the lodge for lunch. After lunch, you will start on your journey to Bwindi national park. Your dinner at and overnight will be at either. You will have breakfast very early and your driver takes you for briefing and registration at the park headquarters before 8 am. You will get Uganda Wildlife Authority a ranger guide to guide you through the forest as you search for the gorillas as he will know where they were the previous day. You will need to carry your lunch because Gorilla trekking will take hours between 1-10 and you will have one hour to spend with them and watch them play with each other, feed their young ones and care for each other so that you the best memories of your gorilla trip. After tracking, you will travel to kabala where you will spend the night and have your dinner as well at either. Day 7; Depart Lake Bunyonyi for Kampala. After breakfast, you will go for a canoe dug ride on Lake Bunyonyi to give you an opportunity to see various birds and different islands before you drive back to Kampala proceeding to the airport to catch your flight back home. End of Chimpanzee and Gorilla Safari with AA safaris and tours ltd.